Once in a long while comes a book that changes the way we look at a particular issue. “World War-D” aspires to be such a book; it changes the way we think about the war on drugs, pulling it out of the ideological and moralist morass where it has been enmeshed from the onset, turning things on their heads – or I should say, back on their feet. “World War-D” re-centers and refocuses the issue around a simple but fundamental question: “Can organized societies do a better job than organized crime at managing and controlling psychoactive substances?” I obviously think they can, and I explain why and how. “World War-D” is the first book to bring one of the most contentious issues of our time to the mainstream in a comprehensive but accessible way, without being simplistic. It examines all the facets of the issue from a global perspective, repositioning it into the wider and more relevant context of psychoactive substances. “Word War-D” offers a reasoned critic of the prohibitionist model and its underlying ideology with its historical and cultural background. It clearly demonstrates that prohibition is the worst possible form of control, as the so-called “controlled substances” are effectively out of control; or rather, they are controlled by the underworld, at a staggering and ever-growing human, social, economic and geopolitical cost to the world. 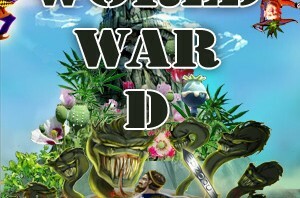 “Word War-D” is the first book to tackle the issue of legalization head-front, offering a pragmatic, practical, and realistic roadmap to global controlled re-legalization of production, distribution and use of psychoactive substances under a multi-tiers “legalize, tax, control, prevent, treat and educate” regime with practical and efficient mechanisms to manage and minimize societal costs. Far from giving up, and far from an endorsement, controlled legalization would be finally growing up; being realistic instead of being in denial; being in control instead of leaving control to the underworld. It would abolish the current regime of socialization of costs and privatization of profits to criminal enterprises, depriving them of their main source of income and making our world a safer place. 102 years after the launch of global drug prohibition, 40 years after the official declaration of the war on drugs, one year before the Mexican and US presidential elections where the legalization debate will be one of the major issues, “World War D” is timely and long overdue, as its topic is rapidly moving from fringe lunacy to the mainstream. A growing wave of support for drug policy reform is rising throughout the world; the war on drugs failure is being denounced across the board, from church groups to retired law enforcement, to the NAACP, to Kofi Annan, George Shultz, Paul Volcker and a string of former Latin American and European heads of state. The book is intended for an international audience and aims to be a major contribution to the war on drugs debate. I find that you have written one of the best books on the drug problem that I have read (and I have read more than thirty books on that subject). For example, your history of prohibition in part 1 is without any doubt the best I have ever read.”“your chapters on possible legalization and regulation and on your counter arguments against it are excellent and I subscribe to them entirely. It is a very good read and already I can say a very important work. You did a fantastic job. It is up there with the very best drug policy books. I believe your book will be extremely helpful to those who have the power to reverse the existing draconian drug laws. Hopefully your book will be a road map to a sane conclusion. When the rulers of our land eventuality exchange prisons for medical clinics the bible hand book that will be used to EDUCATE the citizen in need of help should be your book. It shows how and why we humans react as we do to outside substances. I’m still blown away by the incredible amount of detailed information you have, what an extraordinary work of literature you have here, congratulations. It is a thorough and well-documented compilation, a global overview of all the issues revolving around the war on drugs, prohibitionism and psychoactive substances. It offers a methodical, well-argued and compelling case against prohibitionism and a realistic and pragmatic roadmap to global legalization. Anyone genuinely interested in understanding this failed war and its negative impact on the World should begin by reading this book. I just do not get all this insistence on “war on drugs”. I never used this term. The United Nations never used this term. I fear it is being used to mask other objectives. Drugs were banned by member states because they are dangerous, they are not dangerous because they are banned. If you believe that some sort of (whatever form of) legalization of drugs would be the correct answer – well, I am afraid this would be dangerously naive. In other words, if this is the answer you would like to receive, I must conclude that the set of issues you raised are a bit more complicated than you seem to realize. The only common denominator among them is “former”. What is wrong with people who, when in office say one thing, when out of office say its opposite? I try in “World War-D” to understand where such attitudes come from, how we got where we are, how we are still there after so many years of hopeless failure, how we can accelerate the move beyond such attitudes. Ok, what about those who are already facing time and people now serving time?? You want the same governments to pass policy and earn tax on a medical cure, after the lies they told to the world and damages inflicted to those victims/ causalities of this Fkking WAR? Better think this through very carefully. Greed is still an element and many will or are in line to profit which is already in progress. That so-called tax money will be funding other wars and political causes. This is about trust and we should not trust the government after what was hidden from families whose members died in vain, lives destroyed and personal pain and suffering after going through the system imposed by the same political wheel of ‘justice’ and their law makers. In canada we must thank judge Emily Murphy for helping to pass such a useless document without any regard of the truth or evidence knowing that hemp was already an established industry market that had already provided jobs and exports of materials for many other potential markets. So lets not permit government involvement without first inviting first nations people to be a part of this history and help set them free. So much damage needs to be repaired before selling ourselves short. We’ve waited this long and fought back for seventy yrs, what is another year or so to secure policy change that everyone can live without fear? 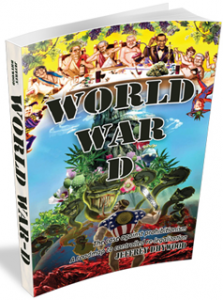 WORLD WAR D is a hefty book of 435 pages that serves as a platform for author Jeffrey Dhywood to illuminate his readers on why the use of drugs – whether psychoactive prescription drugs or cocaine or marijuana or heroin or opium or crystal meth, LSD etc – continues to be an ever increasing problem throughout the world. The cost of the illegal or abused drug market creates crime, addiction, organized crime in cartels resulting in smuggling/selling/inducing needless street warfare, and death. In his words, `Going beyond the simplistic characterizations of the War on Drugs rhetoric, “World War-D” clearly demonstrates that prohibition is the worst possible form of control. The so-called “controlled substances” are effectively out of control; or rather, they are controlled by the underworld at a staggering and ever-growing human, social, economic and geopolitical cost to the world.’ Dhywood pleads for altering this trend by legalizing drug sales in a regulated manner and in doing so reverse the problem much the way the repealing prohibition of the sale of alcohol resulted in diminished crime and societal destruction. But who is Jeffrey Dhywood and how did he become such a banner man for the cause of the reversing the problem we currently face in keeping drugs illegal? The only supplied biography states, `Jeffrey Dhywood is a European-born investigative writer, lecturer and public speaker. He earned a master degree in Mathematics and Logics from a prestigious French school before getting involved at various levels of the drug scene, and was closely stricken by the tragedy of drug abuse. Jeffrey Dhywood lived 20 years in the US and is currently living in Latin America. He is also very familiar with Asia, which gives him a good grasp of the global dimension of the War on Drugs, and its global failure. His academic background allows him to bring common sense and sanity to an issue often mired in confusion, misconceptions and preconceptions’. But the author of this book is well informed about pharmacology, biochemistry, and the very pointed field of the effects of all manner of drugs on brain function. He presents exhaustive data on all the forms of drugs including alcohol that affect brain function. For this reader the author’s own statement of the reason for writing this book is the strongest argument: ` “Word War-D” is the first book to tackle the issue of legalization head-front, offering a pragmatic, practical, and realistic roadmap to global controlled re-legalization of production, distribution and use of psychoactive substances under a multi-tiers “legalize, tax, control, prevent, treat and educate” regime with practical and efficient mechanisms to manage and minimize societal costs. Far from giving up, and far from an endorsement, controlled legalization would be finally growing up; being realistic instead of being in denial; being in control instead of leaving control to the underworld. It would abolish the current regime of socialization of costs and privatization of profits to criminal enterprises, depriving them of their main source of income and making our world a safer place.” It can’t be summarized more succinctly. This book belongs in the hands of every responsible citizen, whether after reading it the reader agrees or not. At least the seeds of change would be well planted. We must change something, soon. Any discussion of lifting prohibitions on a controlled substance can not erase the memories of dealing with the aftermath of someone who used marijuana. As a police officer I can not forget the expression on the faces of a young man’s parents when I had to tell them he died in a car accident. (Subsequent tests showed positive for cannabis). His fiance had to undergo numerous facial reconstructions. Their passengers in the back didn’t fare much better. The young man lost a leg below the knee and spent many painful months in rehab. The girl suffered head trauma and suffers from periodic seizures. The couple they hit had been married less than two years. He is wheelchair bound. She was pregnant and lost the baby and can not have any children as a result. And then there was the young man at a party who was showing off and nearly drown. He might as well have. He can not care for himself because of brain damage. I don’t believe society has any better method of controlling marijuana than it does alcohol use / abuse, therefore can not in clear conscious endorse any argument to the legalization of this or any other mind-altering drug. You present no evidence of causation in an attempt to ‘justify’ continued depravation of human rights for the sake of a prohibition enacted out of hysteria for the sake of criminal mercantilism- you have no shame, nor sense- would we enact such a prohibition on alcohol which is infinitetly more dangerous for driving, yet you are okay with protecting. Accolades and congratulations on your book have been made by many others here and are well deserved. The crowning feature of your work is its provision of a solution. Your book has had a powerful impact on me because it put the pieces of a puzzle together and added so much more. I would like to say your book convinced me, and it has, but there were other factors witnessed over the past years that had led me to your conclusions long ago. Such as: years and years hearing the same canned messages from the drug fighting agencies that were pulled out of the, “Public Statements” file with blank spaces to write in the name of the current drug that has now reached epidemic proportions, or the arrests that only are the tip of the iceberg, with so much left to be done. Demonization of the evils of drug use that should result in masses of slathering drug destroyed people laying in the streets, followed by statements to the effect that many drug users lead normal lives and are undetectable. Police photos showing police wearing thousands of dollars worth of military gear with only the eye balls uncovered, carrying weapons capable of leveling a city block,looking like they expected a nuclear blast, and standing next to their captives, who look like drugs are the least of their problems, and probably provide the only source of satisfaction life provides. Then have to listen to the police public relations division, describe the courage and bravery of these self sacrificing officers who brave death every day. Only to research the statistics on death by occupation and find that law enforcement doesn’t even make the list. Or be called by a professional phone soliciting services asking for donations to the police fund so the police will have more benefits. This is particularly enjoyable when both you and your wife retire after 35+ years each, with none. Or watching the whole State go into a military hero style funeral for a police officer who has died in the line of duty chasing dangerous marijuana sellers, and reading the same day the names only of a dozen construction workers who fell off a roof or stepped into a machine. Then seeing several pages of microprint listings of confiscated goods from drug convictions, and noticing that almost none of the houses look worth more than 85k, and the cars at least 10 years old. Then wondering who are the real victims of our laws. Or noticing with shock that the local police are now able to keep the money generated by these drug convictions for use in their annual buget. Or the newspaper article featuring a local lawyer who is a State Legislator, make a powerful argument for the expansion of drug fighting efforts and then to look up his ad in the yellow pages and note he features drug crimes as a major area of expertise in his practice. Or hear the President of the United States make statements about taking action to review the appropriateness of the drug laws, then note the absence of any followup, and the emphasis on job creation and learning that the drug fighting efforts in the U.S. account for 675,000 jobs. Or the TV shows that feature a police raid on a highschool, resulting in students being wrestled to the floor and handcuffed, roughly hassled and hearded off to the jail, all a planned demonstration of what will happen to them if they get involved with drugs. Or the shows that seem to get a perverse pleasure out of depicting poor, helpless, defenceless, people litterally attacked by a squadron of military equipped police, bashing down doors of very modest homes in the middle of the night rousting a sleeping couple and two small children, handcuffing the parents roughly on the floor, and bashing the walls of the house in search of drugs. As though, seeing massive brute force crushing little people was entertainment. Or being called up for jury duty and presented with a legislative mandated drug case which denies the accused trial by jury, and listen to half of the potential jurrors make elequent statements of opposition to the laws and the social policy they represent, and refuse to serve, myself included. Or reading day after day the details of white collar criminals stealing millions from ordinary citizens then being given three years, and a fine, while on the same day some poor kid who never had a chance get fifteen years for possessing and distrubuting a particular controlled substance previously declared extra dangerous by the State Legislatue. The list goes on and on. These events that have dominated the news for years should convince anyone, whether they have read your book or not, that something is very wrong with our system of justice. A massive extortion system supported by government seem a more appropriate description. But these things have been very well documented in your work and despite their convincing rational factually supported case their remains the sad fact that no one really seems to care. Indeed, after reading your book and taking much time to convince my wife of its merrits, hoping to convert her, an astonishing and, in my mind, the most significant critique of you work was offered by her. One day, after a rather long discourse on my part emphasizing some of the more powerful facts regarding the injustice of our drug fighting system, she suddenly said, “look, I just don’t care. I don’t use drugs, am not interested in using them and never have been interested, I just don’t care what happens to those who do.” I was stunned. My wife is not an uncarring person so this kind of statement from her was inexplicable. I said nothing, pausing for a long while, then feeling forced to accept the fact that she had uttered the most significant statement of all. So, will it ever change. I think of Ghandi,”We can talk all we want but nothing will change until this gets to the people.” “…, I want to change their minds.” Rewatch the motion picture, review the things he did to expose the injustice of the British,.. the long line of white robed Indian citizens beaten by British police and documented by press coverage, etc. A thousand children of legislators and other power people in a line with a marijuana joint demanding arrest by federal police…and filmed by all news channels. ???? How do you make the right people care ? An excellent, well researched and convincing read with copious references and follow up material. This book should be compulsory reading for all politicians, judges and police chiefs around the globe. The only gripe I have (which applies to the majority of literature on this matter) is the repeated reference to ‘illegal drugs’. There is no such thing as an illegal drug. Some drugs are ‘controlled’ but they are not illegal – a plant , a powder or a liquid cannot be arrested, tried, fined or incarcerated. What is ‘illegal’ is the possession or supply of these controlled substances. As such this whole issue revolves around basic human rights. This may seem to be nit-picking but I feel it is an extremely important distinction which further underpins the whole argument against prohibition as a form of social control. Also why isn’t this book available through Amazon UK? I had to order mine from the US. Not a problem but availability through Amazon UK / EU would give this book a much deserved higher profile. I use the term illegal drugs because that’s what they are at present time, which doesn’t change the fact that these substances have been made illegal for no rational and logical reason considering that the most dangerous psychoactive substances are legal. A simple polar shift in values will end prohibitionism immediately: Cannabis is unique and essential to human existence on this planet. Because it is both unique and essential, Cannabis in any form is beyond the rightful jurisdiction of any court. In any society in which the freedom of religion is respected, our freedom to farm “every herb bearing seed” is the first test of religious freedom. Without the freedom to farm, there is no “free market economy.” Induced scarcity and government regulation of an unique and essential agricultural resource warps the economic values that determine human social values. Our society has been addicted to toxic, anti-natural, unevenly distributed, finite substitutes for Cannabis since before we were born. Human values reflect that addiction. Unless humankind learns to appreciate the true value of Cannabis very soon, time will run out for a mobilized global response to climate change. “Global broiling” by increasing UV-B radiation and increasing radiation from Fukushima have accelerated the urgent need to prioritize. I would reply to his question by quoting his previous observation, “I am afraid this would be dangerously naive.” for a person in your position of responsibility. And pointing out that while “…the set of issues you raised are a bit more complicated than you seem to realize…” the solutions are simple. It is the problems created by prohibition that are complex. Latin and South American countries should legalize, but so should the U.S. They’re probably too afraid of the U.S. to outright legalize. The next best thing might be for them to have a Dutch-style coffeeshop system, whereby the national level makes enforcement an absolute zero priority and local governments are allowed to grant tolerance permits like the Dutch gedoogvergunning. They’ll have more tourist money than they currently have, said on a whole on a national basis. Surrounding countries will see that and fill in the empty spaces to cash in. People who never thought of booking a vacation in Costa Rica or somewhere will be saving up and dreaming in anticipation of the freedom to walk into a coffeeshop as an adult and buy and partake without being considered a criminal for responsible use. I believe in the healing power of NATURE! Nature has provided the world with all the nutrition and medicine we need, with just a little bit of help from the medical profession, politics, and organized crime. Legalized therapeutic use of marijuana is the first step in rebuilding the drug culture, with the cultivation and home use of COCA and OPIUM following close behind. I revere the cannabis plant, the coca tree, and the opium poppy as gifts to the world from Nature. I want to know more about these crops and the issues that surround them. Thank you! Well I discovered your book, and would like to propose you to make its french version of it. I’m not a professionnal translator, but I’m an activist for drugs policy reform. I have no budget for it, but I’m actually in contact with a french editing company and I’m just finishing the publishing of “legalize it !” written by Francis Caballero (wellknown lawyer). Let me start with a disclaimer: I am a Londoner grandmother, and when the 60s counter-culture hit, I was teaching in a private school and caring for my baby daughter, so I didn’t get much more from that time than some strange weedy whiffs on the beaches of Brighton on the week-ends. “World War-D” was a gift from friends who probably thought that I should know better. I had never given much thought to the topic and basically bought into the official propaganda that drugs are evil and drug users are degenerates. Living in London, I have quite a few friends who occasionally indulge in anything from marijuana to cocaine, all while living perfectly normal productive lives, but I never quite connected the dots, even as my chain-smoking alcoholic husband was drinking himself to near-death. Besides, the UK is far more permissive than the US, and we have been spared the judicial excesses that seem to be the norm there. The UK is not Mexico or Columbia either, and narco-violence is virtually inexistent. So, reading “World War-D” was a real eye-opener. The accumulation of factual evidence is overwhelming at times (at least for me), but the book is well documented, well argued and convincing. The research is rigorous and impressive, backed by abundant references. Little did I suspect the extent of the damage inflicted by the War on Drugs in many parts of the world. The author exposes the hypocrisy of the US government and its shoddy role on both sides of the issue since at least World War II, starting with Lucky Luciano and the Italian mafia, all the way to Ahmed Walid Karzai and through the Iran-Contra affair. He clearly demonstrates the disconnect between the official propaganda and reality, denouncing prohibitionism as an alibi for racial discrimination, fueling the shocking US incarceration rate, disproportionately targeting the African-American and Latino communities. Mr. Dhywood does a great job at demonstrating the ultimate futility of the War on Drugs, as prohibitionism creates an illegal market place in a market economy, with all the violence and other catastrophic consequences attached to it, at a staggering economic, social and human cost to the world, with dangerous destabilizing effects in many parts of the world. The current trends in the illegal drugs marketplace don’t leave much space for hope that prohibitionism will ever be more successful. As a neophyte, I found very useful the second section of the book dedicated to the psychoactive substances and how they affect the brain. Positioning illicit drugs among other psychoactive substances such as alcohol, tobacco and prescription drugs gives a better perspective of the issues raised by the use of psychoactive substances in general. It clearly demonstrates the arbitrariness of the prohibition of certain substances while the vast majority of psychoactive substances are legally available, with varying degrees of control. The critical role and function of alcohol in Western culture is brilliantly explained. But Mr. Dhywood doesn’t stop at telling us what is wrong with prohibitionism. In the last section of the book, he makes a strong case for controlled legalization of all psychoactive substances, with varying degree of regulation based on the substance and its intended mode of administration, focusing on reducing harmful use. Perhaps if more people like me could be convinced to read this book, public opinion would start shifting away from the official propaganda and take a more critical look at these very damaging policies. The book gives a very good overview of all the aspects of the topic, while presenting constructive, credible alternatives. I highly recommend it. I have just finished reading your very interesting book, “World War D” and I send you my comments, please find them enclosed. Your research is excellent; you have information that overwhelmingly demonstrates the futility and stupidity of prohibitionism and the tremendous human, social and financial costs that it implies, with no positive result. Mexico and our society is the best example of the negative effects of this human mistake, we hope that we can do something to change the current state of events because in many areas of our country prohibitionism is making life very difficult and dangerous as a consequence of these government policies, many of the most valuable people are just leaving us. I feel that you spend a lot of lines or pages on information which is not based on facts or proven data; “it is rumored that” “some sources believe that” and other statements of similar nature, that are not certain but rely on gossip or rumors and are not necessary to prove your point. I have to confess that I do not like the name, on a book shelf it would be impossible to guess what it is about, yours is a serious study and the title is more like that of an essay by a high school kid. And the worst is the drawing at the cover it looks more like a comic book than an academic investigation and effort. I agree on your jacket comments. It almost looks like a comic novel instead of a serious look at a serious problem. When you reprint the book, please consider changing the jacket treatment. A most articulate indictment of the War on Drugs, with a realistic pathway out of it. As you keep turning the pages, the more you learn about one of the most disastrous and the longest lasting US policy failure, the more you want to scream: “Enough already!” Jeffrey Dhywood does a very good and methodical job at dismantling this colossal fiasco, spelling out the humongous toll it has and is still exacting on the world, explaining why it is doomed to failure. Mr Dhywood cleverly breaks down his book in three sections, starting with an historic overview and the current state and evolution of the War on Drugs. The 2nd section deals with the neurochemistry of mind alteration and a detailed review of the major psychoactive substances, with a special emphasis on alcohol and its dominant status in Western culture. The 3rd section offers a critical analysis of prohibitionism, laying out the foundation for a convincing case for global controlled legalization. Altogether, World War-D is one of these rare books that get its point across with force and clarity and make you want to get up and do something about this seemingly intractable problem.